The Phoenix Foundry: Locomotive Builders of Ballarat. The History of a Ballarat Engineering Company. By Bob BUTRIMS & Dave MACARTNEY. Here at Sovereign Hill we are in an enviable position as we are able to portray the beginnings of the Industrial Revolution in Australia. Our museum contains the best collection of working steam engines in Victoria on permanent public display. Because of this we have developed several online education resources and face to face programs designed to support teachers and students studying this period of Australian history. We are continually searching for more material to help our understandings of this subject. Recently we discovered a new book focusing on one of the key foundries which grew from the gold rush period of Ballarat’s history. Marion Littlejohn, one of our Education Officers, has reviewed this book, which we feel would be a useful addition to any year 9 reference library for Depth Study 1 – the Industrial Revolution. 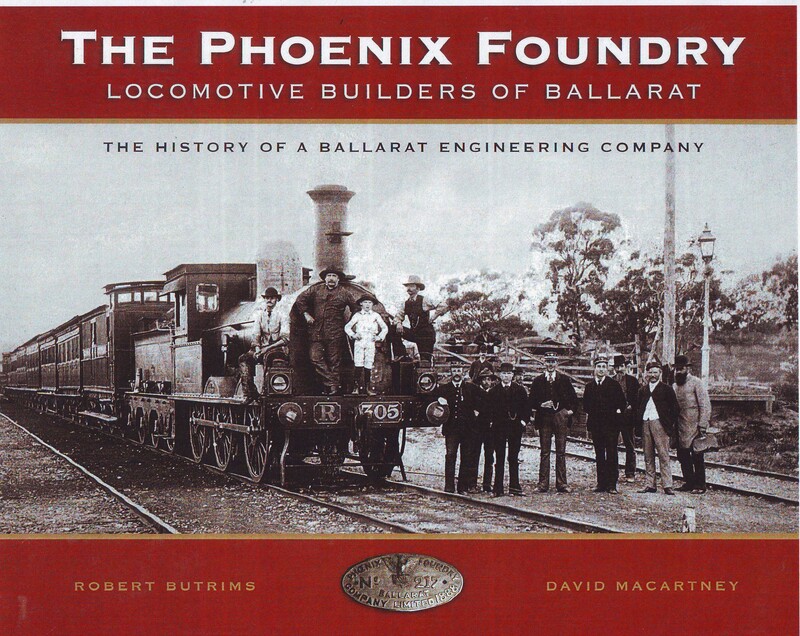 As the title suggests, the focus of the book is the history of the Phoenix Foundry in Ballarat. It begins with an excellent summary of how the need to extract gold from quartz on the newly discovered Ballarat goldfields was solved by mechanisation and as a result the Industrial Revolution came to Australia. Ballarat’s evolution from a gold mining town to a highly industrialised railway city is then clearly and succinctly explained. The rise and fall of the Phoenix Foundry is set alongside the boom and bust experienced by Victoria’s economy after the discovery of gold. Students investigate how life changed in the period in depth through the study of the Industrial Revolution. The study includes the causes and effects of the development, and the Australian experience. An obvious strength of this hard cover book is its impressive collection of historic photographs. These photos – invaluable primary sources for historians – provide reliable visual evidence of the impact of the Industrial Revolution on Ballarat as well as the working conditions of foundry and railway workers. Engine room of Phoenix foundry. State Library of Victoria collection. The images in the book tell the story of a highly industrialised society where large numbers of men and boys were employed either in foundries making trains or as railway workers. 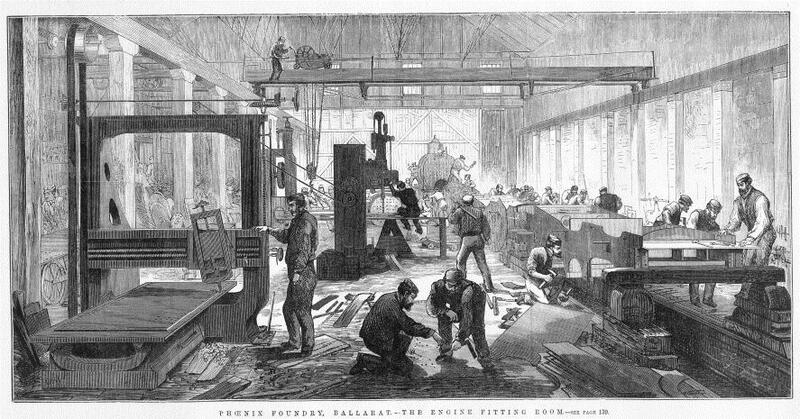 On page 27, images showing the interior of the Phoenix Foundry in 1873 depict a large (all male) workforce and the lax safety standards of the time. These sources provide a window into working conditions of the 1870s. Another interesting topic covered throughout the book is the development of Protectionism. Interestingly it was cheaper to import train engines during the nineteenth century than to build them here, but, to paraphrase the author (page 52), the Victorian Government, anxious to gain public support, created local industries that otherwise would not have emerged without government support in the way of tariffs and later subsidies. The Victorian State Government bowed to local pressure in the 1870s to create and protect local jobs rather than import cheaper goods. In the light of what is currently happening to the local car industry this could lead to an interesting class discussion. Because of the Government’s actions this foundry alone put on 70 apprentices between 1870 and 1873 and by 1884 employed 400 men. As the story of the Phoenix Foundry is closely tied to the development of the Victorian Railways the book follows the rapid expansion of the rail network and its crucial role in stimulating the economy. When recession hits in the 1890s and the government cancels its works program the Phoenix Foundry is badly hit and never recovers. This book helps overcome the lack of resources readily available on our local industrial heritage. While at times it becomes a bit too technical for the needs of most students anyone with a love of trains would find the information fascinating. The book has been painstakingly researched and would be an invaluable source for students studying the impact of the Industrial Revolution on Victoria. 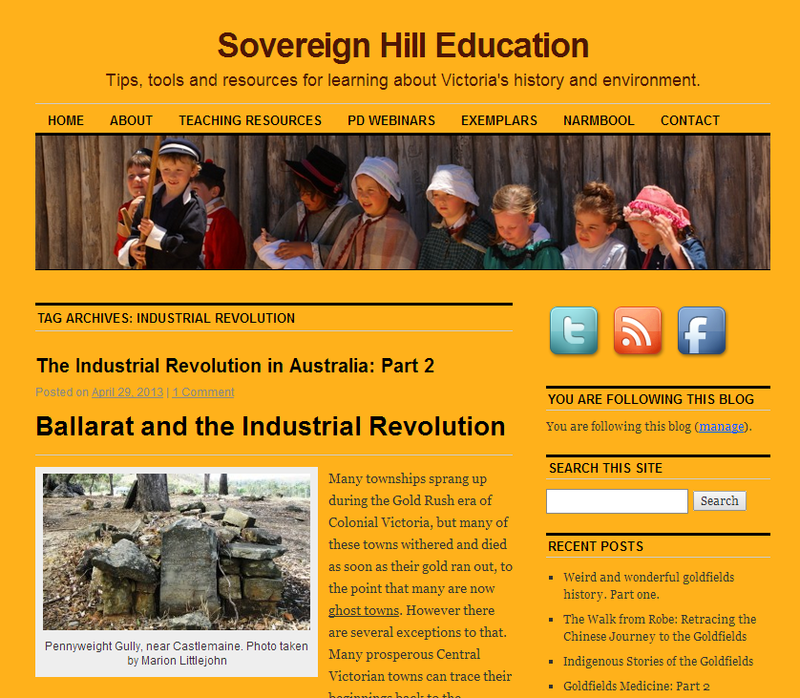 If you would like more information, then have a look at our previous blogs; Teaching about the Industrial Revolution in Australia and Ballarat and the Industrial Revolution. If you would like to continue your research on the Phoenix Foundry, we have also found these images in the Illustrated Australian News for Home Readers from 12th August 1873. Just click on these links; page one, page two. This entry was posted in Books for Teaching History, History Teaching and tagged Ballarat, books, Industrial Revolution, teaching history, teaching resources. Bookmark the permalink. An excellent resource for anyone studying or interested in Ballarat’s role in the Industrial Revolution. Well worth the 60 odd bucks.